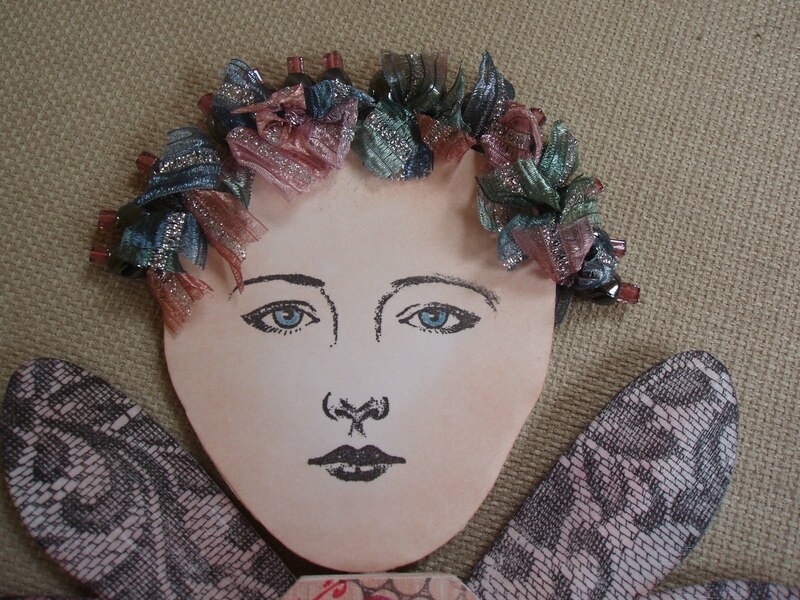 Well, it's my turn to post my Art Doll based on Sue Roddis' project. 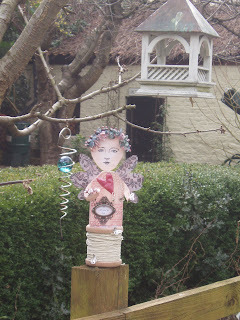 Thank you Jo for seriously taking me out of my comfort zone, as I had never made an Art Doll before. I kept thinking about what Sue had said that you could make one from whatever you wanted to, and decided to make one from a tag book.It was vaguely body shaped, so I was halfway there. I decided to turn the book into a journal about the 'girls' in my life, as Jo's title 'Here come the Girls' just stuck in my head. I've written about my Mum, who introduced me to crafting, Megan my lovely daughter, Jo, Elaine and Lesley, my three blog sisters, you all have pages about you. I have written about Glenda and Lynn from Graphicus, who gave me the stamps and confidence with colour and texture in the first place. I have written about Michelle, my youngest crafting buddy, about Kay and Amanda, who taught me to make jewellery, and then there is a page devoted to the many others; Kay Carley who taught me about Coloursoft pencils, Hels Sheridan, whose blog is inspirational, Sue Roddis, Helen Chilton, and many others who inspire me on a daily basis. I gessoed the book and painted the pages with Salmon and Lake Mist Paint Dabbers. I edged the pages with Watermelon and Mountain Rose ink pads. 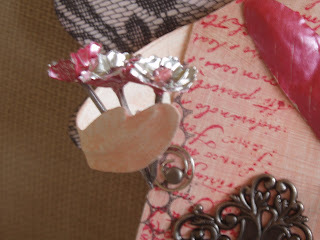 I used a mixture of background stamps with Stone Gray and Cherry Pink Stazon to build up backgrounds. 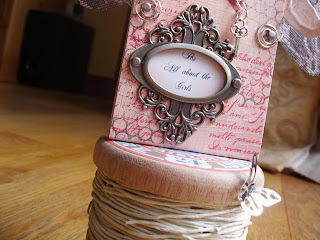 On the front of the book I made an insert for a Tim Holtz ideology plate which reads 'It's all about the Girls'. I have made a battered heart, to which I have added a little key and stuck this on. I have made the book close by bending two Woodware swirly clips and attaching two brads and hooking them on at the front only. They can then be unhooked as necessary. I have made arms with two thicknesses of card and inserted wire before gesoing and painting with salmon paint dabber and a baby wipe. In one hand, Dot (Cotton), as my husband has nicknamed her, is holding three metal flowers, with nails for stalks. I had to put nails in there somewhere, to be true to Sue's project! On the other hand, is perched a metal butterfly. I have used a B-Line stamp for the face, masking the hair and jawline, so that I only inked the eyes, nose and mouth. I used Tattered Rose DI to colour the face and Inktense pencils to colour the eyes. Her head decoration reminds me of curlers, hence the name Dot Cotton. I wanted to use nails, but they were too big for the beads, so I used head pins instead, tying a piece of ribbon at the base before pushing them into the cardboard. 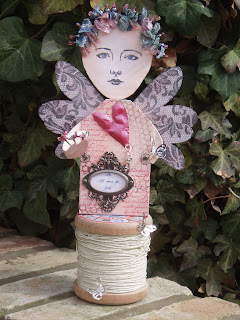 The wings are coloured with Tattered Rose, Victorian Velvet and Weathered Wood DIs, before stamping with a very old Aspects of Design lace stamp. Elaine's husband very kindly sourced me a vintage cotton reel label, sized perfectly for my hand made wood turned cotton reel. I have used twisted paper string to represent the cotton, and attached two more metal butterflies. Oh my Judith! This is just totally inspired. How lovely to turn her into a journal or should I say turn the journal into a doll. The soft colours are gorgeous and I love her 'curlers'. Those tiny flowers in her hand are so sweet. Terry's name for her is perfect and she's simply wonderful! Well done! Another gorgeous doll and it is so intgeresting to see the different interpretations. Having taken the plunge I'm sure you will make more. Judith, she is wonderful! I actually gasped she was so unexpected. Even with your hints on your own blog she was a real revelation. I love how you have interpreted the doll idea and your colour scheme, as ever, is delicious. I'm trying to decide which is my favourite bit but I can't. Her hair is just inspired and the hand with the flowers...well...perfect! Can't wait to meet her in person. This is lovely - you four have really hit on something here, you are really tapping into your creativity - well done. I was speaking to Sue yesterday and she is thrilled that you are all inspired by her doll and doing such different things, that's what she's aiming for! This is such a lovely project - a wonderful idea and I feel privileged to be part of your journal. I love the soft colours and the way you have bought all the elements together. 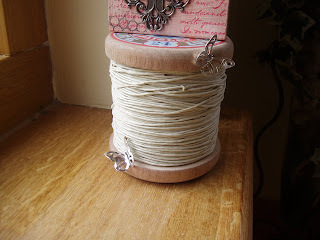 So many skills and ideas coming together and I love the soft colour scheme too. That cotton reel works a treat doesn't it. Like Jo I look forward to meeting her in person. Well done for getting her finished and posted given the busyness of the last month for you. Fabulous, Judith. Love the journal idea! Wonderful details. The flowers in her hand, the spool, the hair. Very lovely and creative. love this creation,such a wonderful take on Sue Roddiss' article. Absolutely wonderful! 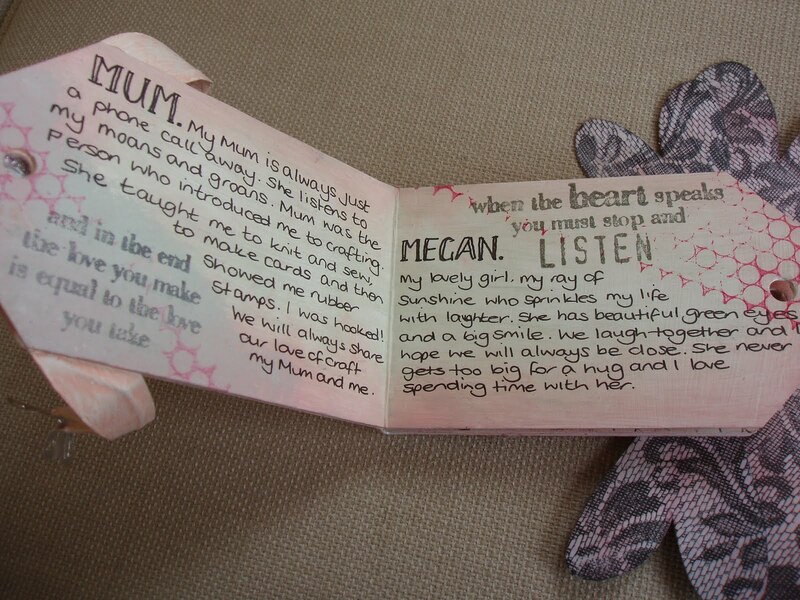 Qhat an inspired idea to incorporate a journal into your doll, just brilliant.